A.M. Ran with Jeff, Daniel, and Mary Ann. Again, speed micro-injection. Jeff repeated his 4:42 mile with the exact same splits as on Tuesday, but did not feel inclined to go to 1.25. I paced Mary Ann again through the 5:20 until failure or to 1.25. Mary Ann fell back a bit around 0.75, then closed the gap with a kick by around 0.9, then she wanted to kick to the end, but I told her to go to 1.25 instead. She went through the mile in 5:19, and fell back after that. I wasted the second she gained on yelling at her to close the gap, then got back to pace and finished 1.25 in 6:40, 5:20 pace on the dot. She coasted through the last quarter in 87 and finished in 6:46. That is significant progress, though, compared to the last three attempts. Eventual goal is for Jeff to hold even 4:40 pace for 2 miles, and for Mary Ann 5:20 pace for the same distance. My thoughts on 5 K training. Once you can run 12 quarters with 90 second rest significantly faster than your dream target 5 K race pace, the traditional VO2 Max training (12x400, 6x800, 3x1600) is not very productive. The only exception would be 3x1600 with 1 minute rest at dream pace. The interval should be at least 2000. Otherwise, you learn to run the first mile of the 5 K at dream pace, but you fade in the second. You can cheat in the first mile by running anaerobically. You cannot cheat the same way in the second. Once you can run a mile at 5 K dream pace and live (400, 800, 1200, and 1600 get you there), the next step is to work on the second mile. So you need to learn to run 2000 at dream pace and live, then 2400, then 2800, then 2 miles. Once you can run 2 miles at dream pace in training and live, the race day magic can carry you to the end of the 5 K on race day at that pace. It is very important to keep the pace even on those long survival intervals, not die in the last quarter, not buy yourself a cushion in the first, and not rely on the kick to catch up to pace in the last quarter after fading in the one before it. The reason is we need to maximize aerobic involvement and minimize anaerobic cheating, because we cannot use much anaerobic power after the first mile. On the way back I ran a post-VPB 79 second quarter. Total time for 10.1 was 1:19:37. P.M. 2 with Benjamin in 16:02. 2 with Jenny in 17:58. Julia ran the first mile in 9:27. Hmm very interesting Sasha. I had to read over what you were saying about the 5k training. I will have to try that out. Good stuff. Thanks for sharing. Its an interesting idea but physiologically you are doing the opposite of what of you propose. The involvment of the anaerobic system is far higher during the second half of the interval than the first half--lactate/proton production at faster than threshold paces over time is curvilinear. Accordingly, most top coaches, Daniels included, limit VO2max type intervals to 5 minutes are less because the lactate burden becomes too high thereafter. Of course time-trial/race-simulation efforts are execepted. I think the difference between the 5 minute interval theory and mine is that the former tries to maximize VO2 values, while I am trying to maximize the 5 K performance. It may very well maximize VO2, but not necessarily the 5 K speed due to numerous other factors some of which are understood and others are not. I've seen time and again how theoretically VO2 Max trained collegiate runners during a 5000 meter race crash at the exact same spot - between 1600 and 2000. Plain common sense explains why - the longest interval they run in training is 1600. They do not know what to do when they have to go further at a fast pace. Incidentally, the same thing happened to me off traditional VO2 Max training. Tempo runs could not fix it. I would settle into the tempo run pace once I went a little bit past the mile mark and hold it to the finish. Extending the interval past the mile or dramatically reducing the rest in between the mile intervals (200 meter jog at about 12:00 pace) made a difference, though. 1) How often would you do these extended race-pace workouts? 2) And the key question, what benefit will they confer that racing every other week will not (I have some ideas here)? 3) What specific breakthrough did this training bring about for you and how quickly did it occur? 1) Ideal frequency is to be determined. I am leaning towards 1-2 times a week in addition to regular racing (twice a month). 2) Controlled environment. You can take your splits every 200 meters, pick your course, have a pacer, run very even, will not slow down earlier than you should to save the race and get a faster finish time. Plus you do not have to drive to the race and can do it whenever you feel up to it. Not sure about the benefit of shorter follow-up intervals. There might be some. Year 2001. Workouts were 3x2000 starting at a tempo pace in the first 800 and gradually winding up to dream 5 K pace. 400 recovery. Did it for about 2 months. PR'ed in Draper Days by 4 seconds, the PR was 2 years old. What was special about that race, though, was not the PR but the fact that I was able to put in a half mile surge from the mile to 1.5 and catch Dennis Simonaitis and Craig Lawson. They ended up with around 15:10. So I died pretty bad from that surge, but I could do it, something I could never do in the past. 2004, the key workout was 3x1 mile with 200 recovery. Did it for about 2 months. Broke my 2001 PR by 18 seconds in Draper Days. This is the hardest 5 K I'd ever run in my life. I was in pain after the first mile, but I was not slowing down much adjusted for the terrain. Since then I've been in better 10 K shape, but never quite the same 5 K shape. In 2004 I labored at 5:30 pace in tempo runs (flat surface). In 2007 the same effort produced 5:20 pace. I thought I was going to shatter my 5 K PR to pieces in Draper Days. But I ran only 16:04 (the PR is 15:37). It was hot, though, but even with the adjustment I think I still fall short. I felt a lot fresher in 2007 than in 2004. 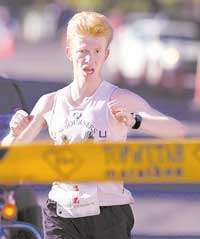 In 2007 I felt I had just run a tempo. In 2004 I felt I had just run an all out mile except it was 3.107 times longer. Also, in 2007 the last 2 miles were weak. In 2007 I focused on 400 repeats and tempos. I could coast through a quarter in 63, ran 4:46 flat mile in a time trial, so the mile speed was OK as well, as least as good as 2004. But the connecting element of the 5 K pain tolerance was not there. Another interesting detail. At the end of 2004 my VO2 Max was 75.9 with RER of 1.00 reached around VO2 of 67. In 2007 I arranged the test, but I could only do it the day before Top of Utah. So I did not push myself into the utter misery and stopped the test probably a minute early. I got up to 68 with RER of 1.00 reached at 64. I felt maybe I could have pushed it a little bit past 70. Also, when the pace/grade increased, compared to 2004 in 2007 I went from marathon pace comfortable to "I cannot do this for more than a couple of minutes" a lot faster. My RER was only 1.04. In 2007 I pushed it to 1.06. I did, however, run faster marathons in 2007. Pretty similar workout that I did with only 30 seconds rest was 3x1 mile. Downhill for increased speed and turnover, and a total of almost 15 minutes at dream goal pace. Overall would this not be as good if not better for both increasing economy, speed and VO2 max? I'm open for some analysis from both of you. Actually in 2004 my 3x1 miles workout was downhill - about 1-1.5 % grade. What is important to remember. The building blocks must be there for this to work. The aerobic base needs to be solid. The leg power needs to be solid. Then you use this workout as glue. Aerobic base is obvious - if you've been consistent with the mileage in the last 9 months, it is most likely there. Leg power test - several variations are possible. For the 5 K focus, I propose the following: 12x400 with 2 minute jogging rest. Should be able to average at least 5 seconds per quarter faster than the dream 5 K pace. On the second thought, the above leg power test is really testing the condition of the fibers that can potentially be utilized in a 5 K.
So from your experience the extended race pace intervals gave you more staying power at 5k pace, rather than making you faster per se, which would result in a faster time at the same effort? How many of these sessions did you do in the 2 months preceding Draper? I think the 3 x 1 mile down hill with 30 seconds rest can be better for improving speed and economy, with its value somewhat depending upon its context into the overall training pattern. Clearly there will be faster leg turnover and higher impact forces which can both increase economy. Its probably inferior for VO2max work because 1) glutes and hamstrings are not recruited as much, and calf range of motion is less uphill so their relative oxygen demand will be less, and 2)30 seconds recovery between miles is not enough unless the workout turns into an all-out race effort. Truly reaching VO2max is hard, hard work, which is why most stick with the 3-5 minute with equal recovery rule. Most people claiming to do VO2max workouts aren't actually reaching the right intensity level, which is signficantly faster than 5k pace. I am not saying its an inferior workout for improving performance. Just that if you take the reductionist approach to training, and isolate VO2max as a single component to stress, then you need to stay in the 3-5 minute range. I strongly agree with your statement that the building blocks need to be there. ***The goodness are badness of almost any workout is context dependent. *** When some says I ran 6 x 800 in 2:30 with a 45 second recover, is this a good workout, you need other information to answer the question. What is their fitness level, what are they training for, what has their training been the last 3 months, when is the key target race, what workouts will be coming next? Its the overall training pattern that matters most, which is why continued cycling and periodizing is essential for long-term improvement and having your A game ready for you key race(s). I think is important to stay in touch with foundational systems year round, and that certain phases, especially in the preseason, should be dedicated to building those foundational systems. Functional leg power is a foundational system and I think is best functionally tested by measuring top-end speed. It doesn't matter how much someone can squat, how far they can jump or bound, etc., if it doesn't correlate with how fast they can sprint, which is the fundamental quality that matters. (Sasha did you ever reach the blog from Nate Jenkins I posted the link to? He has worse top-end speed than you but runs faster than you at every distance from 800 meters and up). I agree with your point on functional speed--short squatty guy who runs a 100m in 10.8 will probably struggle to break 20 minutes in a 5k. Overall, I think the extended race pace intervals can be a key component in a well-thought out training system. In my opinion, 2x/week year-round will be complete overkill and rapidly lead to staleness and frustration. These are very demanding mentally and physically and need to come at the right time in a training phase to most effective and to be tolerated. I've commented several times on what I learned from my foray into serious weight lifting where the periodization research is much better. Probably the most important thing I learned (which I had been told before but did not truly understand) is that although extremely high intensity workouts are extremely potent for stimulating adaptation and essential for peak performance, they exact a heavy cost on the nervous system and CANNOT be tolerated year-round by a drug-free athlete. Physiologically, thats what these extended race-pace intervals are--there is a progressive recruitement of faster, less oxidative fibers, as the preferred fibers fail. This places considerable stress on the nervous system and muscle cells go into deeper acidosis--remember lactate production overtime as paces like these is curvilinear. I'll probably incorporate some of these workouts at the right time, because in my mind, the end goal of all training, is to maximize functional muscle mass. Executive summary: There were 3 workouts 3x1 mile with 200 jog recovery, one 2000 meter run at hard effort, 3 "tempos" connecting all the 3 miles (same miles down the Provo Canyon) only 20-30 seconds slower than the sum of 3x1 mile and the last mile in the range of the last repeat of 3x1 mile, one 5 K race, three 10 K races, three 10 K tempos in the middle of a medium long run that were essentially race effort, one 10 mile race, and two Squaw Peak tempo sessions (4 miles up the Squaw Peak road all out, then a couple of minutes of rest, and 4 miles back down with the pedal down to the floor). Also, I did fair amount of 10x(10 seconds all out + 50 seconds rest) for a week as an experiment. My 10 K races followed a pattern of essentially racing the first 5 K all out, and then using the aerobic base/tempo training to run a decent pace to the end. So all in all, there was quite a bit of this staying power type of workouts, also I think I hit the right combination of uphill vs downhill running for me. Definitely I felt that the staying power and not speed was what improved. Compared to Heart of Holladay on June 12th, Draper Days on Jul 17th was pure torture, especially the last mile, because finally I was able to race it rather than just tempo in. Sarah's comment about my Draper Days finish was "You looked like if you were a lion you would roar". Heart of Holladay performance quality was around 15:55 in Draper Days due to the course difference. So the improvement was about 18 seconds. Another interesting detail. On July 4th I ran the 10 K. Prize money went 3 deep, but there were three collegiate runners: Chandler Goodwin, Brad Parker, and Jesson Baugmgartner. Chandler was gone, but I was able to hang with Brad and Jesson. I was determined to run with them until I die. I made it to 4 miles at about 5:15 pace. Then I slowed down, but about a mile later my quad cramped up and I wondered if I'd be able to finish. Slowing down to 6:00 for a bit fixed the problem, and I was able to kick, but nevertheless, I had never in my life been able to run so hard that I'd get a cramp. Related to our whole discussion is the phenomenon called the "VO2 slow component." The slow component is elicited at speeds between the LT and VO2max. If someone begins a continuous run at the half way point, initially VO2 will increase rapidly to meet the acute energy demand. This is the fast component. The slow component is a small but continued rise in VO2 despite the constant work load. The exact mechanism responsible for the slow component has not bene demonstrated. I think that it is a change in muscle fiber recuitment patterns whereby more FT fibers are included in the rotational mix. There is great controversy in this area with many claiming that progressive recruitment of FT fibers is not the cause. They base this of EMG data, which can be less than reliable when trying to detect subtle changes in recruitment patterns. Its also possible that it is a compensation for greater blood flow to the skin because of increased core tempurature. I think this likely plays a role. Interestingly, the slow component is less pronounced in highly trained athletes. I think that the extended race pace intervals may operate on an analagous principle--they engage and therefore functionally train FT fibers that are less active for more traditional intervals of 5 minutes or less. However, as I emphasized before, I don't think this is a "magic workout." Optimal training is orchestral. One note doesn't make a masterpiece. How they are arrange relative to each other is the difference between noise and a masterpiece. Some thoughts. When I am in good shape, I have a bigger HR drift during a 5 mile tempo. I can also keep my HR at its max for longer. When I am just aerobically fit, the drift is smaller. I reach the peak HR about 1.75 miles into the tempo, and then it might even drop some, along with the pace. I can only push it to 164 in the last 400 meters, the pace being still only a tempo pace. When I am racing well, HR will keep climbing throughout the entire tempo, holding steady at 164 in the last 2 miles. I will be able to speed up considerably in the last 400 and drive HR to 168-170. The two different conditions can happen not only from month to month as the fitness changes, but from day to day. I could have a random bad day when HR is stuck at 158, and the pace is stuck at 5:40 or slower after the first 2 miles. Note that by racing well I mean I do well in all distances 5 K to the marathon. I've never been able to run a good marathon when I was consistently seeing the absence of HR drift in the tempos. So, my thinking is - given a good aerobic base, you actually want to increase the VO2 slow component. This improves performance in all distances. And as a side note - whenever I read a scientific article about running I cannot help but think of a guy that is trying to figure out how to do something in his spreadsheet program by using a dissassembler.